We install air conditioning units that will monitor a room to see if it’s being used, if it’s not then it will automatically switch off your air conditioning by means of emulating the off function of your A/C remote controller. This ensures that the A/C unit goes through its correct shut down procedure. The products that we supply include technology that can monitor a room for movement to see if it is being used, if it’s not then it will switch off your air conditioning, with the dual benefits of both saving you money and helping the environment. There are products with a comprehensive range of PIR sensors that will control air conditioning to your requirements. There are many applications that successfully controls the abuse of air conditioning within the holiday rental industry, offices, schools, surgeries and retail units. We can provide Air conditioning sensors, that helps you save money on aircon and stopping air-conditioning abuse to rentals. We use leaders in air conditioning sensor technology and have been supplying sensors all over the world since 2008. 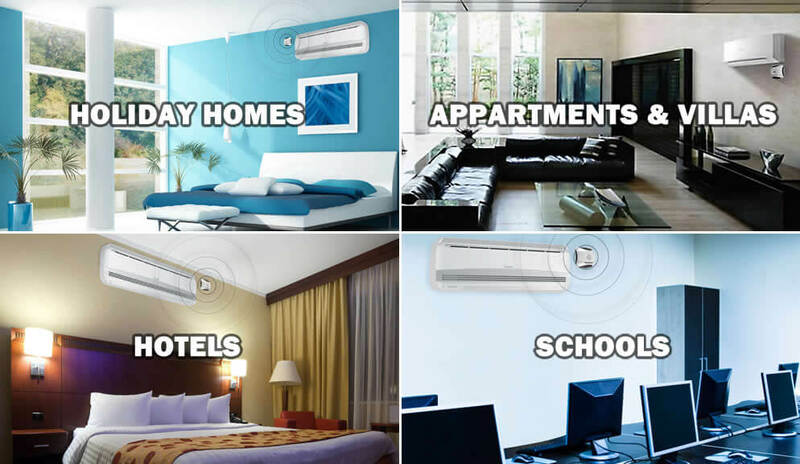 Products that were launched after personal experiences within the holiday rental air conditioning industry. The industry has shown up to 80 percent of air conditioning provided to clients was wasted on keeping empty rooms cool. Stop air conditioning abuse and let us fit intelligent A/C units for you!